Okay, so it's a couple hours from Erawan Falls, a decent distance from Bangkok, but soooo worth visiting- Maekhamin Waterfalls. For nature lovers, it's a must, and comes with the distinct advantage of being far less crowded than Erawan. First of all, for as beautiful and fertile a country as Thailand is, the average person here is quite poor. The minimum wage is 300 baht per day, and a decent salary for Thais is the equivalent of $500 per month. That said, there are VERY wealthy Thais for whom money is no object, but the majority of people here live on a very low income. Which is why I am always so amazed to see so much wasted food here. Growing up, I thought it was a sin not to finish all my food because so many people go without, but on my honeymoon in Koh Kood, a beautiful but hard to get to island an hour and a half off the coast, I saw a group of wealthy Thais leaving most of their Expensive meal at a resort untouched. 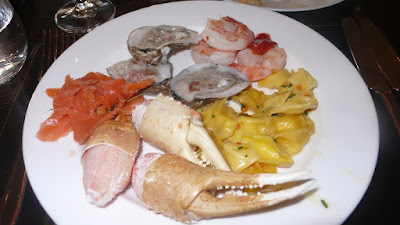 I was aghast, it included a plate of super expensive seafood fresh from the ocean, left on the plate exactly as it arrived. Thailand is known for having three seasons, hot, hotter, and hottest and when you're lucky a healthy dousing of welcome rain, usually lasting only several minutes, which softens the ground and cools you off. However, occasionally the precipitation can turn into a monsoon, and walking outside is the equivalent of being drenched by a shower turned onto the highest volume. Clothing is instantly drenched all the way through, and your shoes and socks will quickly suffer from mildew and jungle rot. Bring the shampoo if you want to wash your hair. For someone who truly enjoys the moisture of a tropical shower, at these moments, I find an umbrella a necessity. It is said that Thailand has three seasons, hot, hotter, and hottest. In addition to this, it gets incredibly muggy here, making for some sweaty conditions. So, leave some sweaty clothes in the dryer (there are no dryers in Thailand, just the sun) and with the climate as it is, it takes far longer to dry the clothes then if you lived in never a drop of rain Las Vegas. Clothes here, I swear they ferment- you could get drunk with the residue left over from your "dry" clothes. In addition to the mildew forming, get your clothes wet a couple times and get ready to toss them out. Business is good for clothing retailers here in the BKK. There’s a building in Bangkok, near the river, the locals call the ghost building- a high rise condo in a prime location whose structure was built, but for one reason or another, today lies in disrepair, a monument to wasted recourses and a deal gone bad. Across from the ghost building, Lebua Sky Bar, the ritzy club featured in the Hangover 3 on the 64th floor featuring $25 cocktails and $600 half-bottles of wine. Looking from the balcony of the sky bar, the otherwise dark Building of Ghosts is illuminated by the surrounding lights of the city. In a brilliant marketing move by the world’s largest company, a giant billboard 15 story poster is plastered across the windows of the Ghost Building featuring technology’s ultimate luxury item, The iPhone 7. For the revelers at the Skybar there for the status, the awesome view, or just to have a good time, the iPhone 7 will be forever and unconsciously associated with this experience. Brilliant marketing in the BKK.